RoboSea’s RoboShark is a bionic underwater shark robot made for use in ocean for high speed without the noise. The RoboShark can mimic a real shark like closing on a subject rapidly, travels up to 10 knots or 11.5MPH, and was built on a real shark as prototype. It uses a 3-joint fin instead of a propeller that allows it to operate with little noise and also helps it save battery life. The shell is made from sound-absorbing material so it can be disguised underwater. It weighs 120 pounds. While this underwater drone is not meant for consumer use, this may definitely help marine scientists to more effectively follow and observe the ocean creatures. Now, if you need something for the weekend, RoboSea also has its mini underwater drone called “Biki” that you can already buy on Amazon for $799 USD, this little drone has a built-in 4K camera with anti-shake gimbal and even features underwater acoustic remote that works by sending sound waves to the Biki drone while underwater. Biki can travel 196 feet deep and you can even set a planned route using its GPS. Remember my 4K underwater videos I made in Hawaii couple months back? Well, it is really hard to film things underwater even with the right equipment. In fact, I almost died a few times while trying to get used to my snorkels. With the Biki, you can let the drone do the filming so you don’t have get yourself wet. It also features infrared obstacle avoidance system along with return-to-home feature so you don’t have to worry about hitting some corals or getting lost in the sea. I definitely think underwater drones will go mainstream in the next few years. Yes, they even had a prototype that mimics a stingray, way too cool. Omnron had their Forpheus PingPong robot and I got a chance to play it. While the PingPong robot isn’t actually something you can buy, this was definitely one of the most fun experiences at CES 2019. Omnron’s PingPong robot can assist itself to a new toss when serving. The robot uses AI to predict the movements of its opponent, type of shots its opponent plays, and also has ability to predict the exact trajectory of return balls. It has a 3-camera 3D system that senses the ball and also evaluates the players. With a 3D virtual space it uses, the ball’s location is detected up to 80 times a second. For reaction, Forpheus uses high-speed 5-axis motor system to swing the paddle at the ball. Personally, I am not a good ping pong player so I lost most the matches but this may definitely help anyone to get better at their ping pong game. Of course, there was one flaw, if the player bounced the ball high enough above the 3-cameras on top, it would just freeze since there was no data while the ball was riding high. I am still impressed though, this is definitely one of coolest things to try at CES 2019. Of course, passenger drones are becoming more popular at CES every year and this year, I saw more passenger drones than ever. I saw Dubai Police drone that is actually being implemented by the Dubai Police department and even jet-powered passenger drones that will allow you to go pretty darn fast. Samsung always has their VR booth with fun rides and this year was great also as we rode on the Samsung Gear VR and played a car racing game that mimicked a real race car with motion-enabled chair. While we didn’t end up winning anything, we definitely recommend you to visit on your next CES. 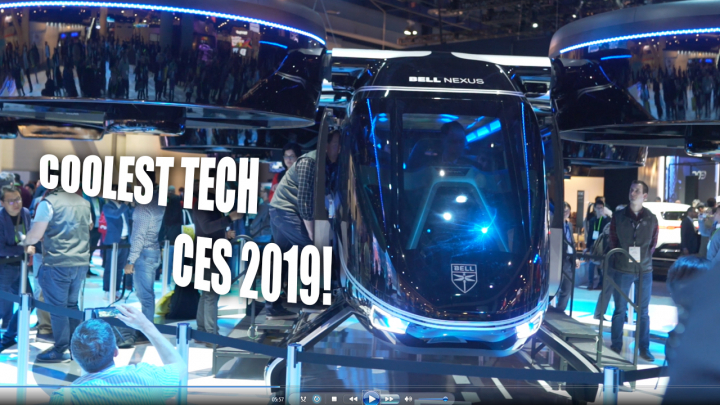 Uber was featuring their future flying taxis with the Bell Nexus passenger drone, probably the biggest passenger drone I have seen. The drone features 8-foot ducted fans that can rotate 90 degrees to lift off the ground and travel horizontally much like the F35B fighter jet. While this wasn’t a real production model as its propellers were just a mock-up design, this is definitely going to be a thing in a few years and don’t be surprised if you are able to get a flying uber ride in a few years. Flight testing will begin by 2023 and may roll out to the US shortly after. I also had the chance to try out Samsung’s new Smart Car Concept, which features a custom Android Auto integration that’s fully integrated into Samsung’s eco-system. You can expect most of your gadgets to be connected to the car so you can control everything from the car. If you have a Samsung fridge, you could control it from the car. The car also features cameras pretty much everywhere around the car along with back mirror cameras that can also detect people and perhaps used as human-avoidance system eventually. You can also customize the dials on your car easily. While most of this is concept, one thing that stood out to me was face unlock instead of a remote. You could easily start the car with your face. The back seats is where things get pretty awesome. You can enable back seat driving at the touch of a button and the screens pop up. You can also create and login as a different user on each screen, allowing each user to watch his own movies, listen to his music, etc..etc… And best of all, this runs all under one Android OS. Definitely Android Auto is going to be really exciting seeing how Samsung is implementing it with their products. CES 2019 also featured its first-ever “Smart Yacht”, this is Furrion’s Adonis Smart Yacht. The $5 million yacht features snart mirrors, touchscreens and voice controls everywhere running its own customized AI called “Angel”, a customized version of Android that keeps everything on the boat connected. smart mirrors/touchscreens everywhere on the boat that makes your ride on the ocean more enjoyable. San Francisco to Asia with voice control may not be too far away. fun and I think would may be better if they made it a bit more scary. And of course, CES 2019 would not be same without Korean BBQ. We took a quick trip to 888 Korean BBQ that opened 2 weeks ago featuring marinated pork belly. While it wasn’t the best Korean BBQ I have tried in Las Vegas, it is certainly recommended for those of you who love pork belly and Korean BBQ. Next story Hand Warmer USB Power Bank Review! Previous story Android Setup Wars #2!